Boston College hosts "Fifty Years Bread and Puppet: Cheap Art and Political Theater"
The Boston College Theatre Department is proud to announce a one-day symposium with performance in celebration of the fiftieth anniversary year of the Bread and Puppet Theater, the foremost populist, political theater in the United States. CHESTNUT HILL, Mass. - Aug. 7, 2013 - PRLog -- The Boston College Theatre Department is proud to announce a one-day symposium with performance in celebration of the fiftieth anniversary year of the Bread and Puppet Theater, the foremost populist, political theater in the United States.The event -- titled "Fifty Years Bread and Puppet: Cheap Art and Political Theater" -- will take place on BC's Chestnut Hill campus on Saturday, September 14, 2013.In the morning and afternoon, there will be scholarly presentations examining the aesthetics and politics of Bread and Puppet and panel discussions looking at the company's legacy and influence. Archival film footage of Bread and Puppet performances over the decades will be screened. Bread and Puppet founder Peter Schumann will provide the keynote address in the form of one of his famous "Fiddle Lectures." The celebration will culminate with an evening performance by Bread and Puppet of “The Fifty Years Cabaret” followed by a public interview with Peter Schumann. "Fifty Years Bread and Puppet: Cheap Art and Political Theater" is being organized by Scott T. Cummings, Chair of the Boston College Theatre Department, and Dr. John Bell, eminent puppet theatre scholar and Director of the Ballard Museum of Puppetry at the University of Connecticut.The symposium serves as a continuation and capstone for the residency of John Bell as Boston College's 2012-2013 J. Donald Monan, S.J. Professor of Theatre Arts. During BC's "Year of the Puppet," Bell taught two courses in puppet and object theatre, curated an evening of contemporary puppet and object theatre performance, and directed an original shadow puppet play as part of "New Voices 2013," an evening of original theatre by Boston College student artists. For more information go to www.bc.edu/theatre. The Bread and Puppet Theater was founded by Peter Schumann in 1963 on New York City's Lower East Side as a political theater focused on the problems of the neighborhood. Over the years, it developed a unique aesthetic and mode of production that uses puppets, masks, sculpture, music, dance, and language to address troubling political and economic conditions and to resist the monolithic power of imperialism and capitalism. In 1974, Bread and Puppet moved to a farm in the Northeast Kingdom of Vermont, which has remained its headquarters for four decades. A two-day festival of puppetry and pageantry titled "Our Domestic Resurrection Circus" was presented annually in the summer until it was discontinued in 1998. Bread and Puppet is one of the oldest, nonprofit, self-supporting theatre companies in the country. It continues to tour many months of the year around the United States and abroad, including an outdoor performance of the Total This & That Circus on Sunday, September 1st at 3pm on the Cambridge Common in Cambridge, Massachusetts. Events for the daytime symposium will include scholarly presentations by theatre historians and researchers from Northwestern University, Reed College, Harvard, Goddard College, Central School of Speech and Drama in London, and other institutions. A panel of independent artists -- including visual artist Kiki Smith, satirist and solo performance artist Paul Zaloom, media activist Dee Dee Halleck, puppet artist Amy Trompetter, actor George Bartenieff, and playwright Erik Ehn -- will discuss the effects that Bread and Puppet has had on their work. Current and former members of the company will share their perspectives on how they collaborate to create new work. Archivist Adam Schutzman will screen seldom-seen footage of past Bread and Puppet performances. 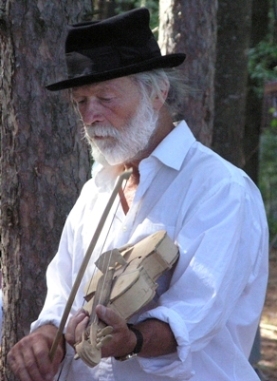 And, as a keynote address, founder Peter Schumann will deliver one of his fabled "Fiddle Lectures," a semi-improvised mix of performance and polemic. A detailed run-down and description of the day’s events can be found at www.bc.edu/BP50. Advanced registration through this site is required for the symposium and the 7:00 pm performance by Bread and Puppet of The 50 Years Cabaret, four short plays drawn from different periods of the company's history. The program includes Dead Man Rises, President & Chair, History of Humanity, and A Man Says Goodbye To His Mother and will be followed by a public interview of Peter Schumann by John Bell and an informal reception. Registration for the full day's events is $25. Online registration is open as of Monday, August 5, 2013 at www.bc.edu/BP50. Seating for the evening performance is very limited and only registrants for the day's events will be guaranteed a seat. Remaining tickets will be made available to Boston College students and then the general public on a first-come, first-served basis. For more information and/or to register, go to www.bc.edu/BP50 or contact the Boston College Theatre Department at 617.552.4012.